Be prepared! The warm up arena on the day of your ride is no place to find out that neither you nor your horse is adequately prepared for the task at hand. Being prepared means knowing how to helpfully ride and show off all of the movements you need to display as well as the transitions between each and every one. Being prepared means having you and your horse properly groomed, attired and fit for the job at hand. Being prepared means knowing your work and also what the judge is looking for in each movement. Harmony! The judge does not want to see your struggles or your arguments in the arena. They want to see the partnership you have developed with your horse in your daily rides on display. They want to see you make effective corrections that are understood and answered by your horse. Can you do that? If not you are not ready to show. Balance! Every movement and every level has a balance point that best defines it. At the lower levels it may be more of a level balance and as horse and rider move up the levels the balance should become more uphill. The whole test should display an appropriate balance as the movements are performed. Having good balance requires that you as a rider are in the proper balance over your horse and in good control of your weight placement at all times. If your horse is not in good balance you will likely have connection problems because of it so use half halts and leg aids to achieve that perfect balance point and then relax and ride in neutral the instant you get there so your horse learns. Connection! 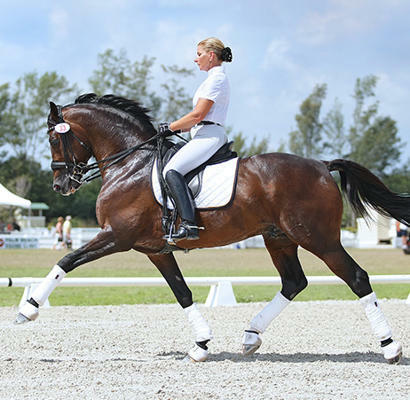 The connection you share with your horse through seat rein and legs will be evident in every movement you ride. Is your connection all it can be? Likely not because that is one of the hardest things to get, keep and maintain. Work daily to be sure that your connection, when correct, is enjoyable and effective for both you and your horse. Half halts should not change your connection. The connection is the feeling that you and your horse share on the reins between all the aids and interactions. If your seat, legs and arms cannot all work independently then your connection will suffer for it. Accuracy! So many points are lost in test riding because of accuracy. Know your geometry! Each movement is supposed to start when your shoulder arrives at the letter the movement begins and end when your shoulder arrives at the letter described on your test sheet. Halts should be maintained for three seconds minimum. Nothing but straight on the centerline. Stay on your diagonal line! Ride proper circles that start and end exactly where they should. Being accurate shows respect for the level you are showing and control of the horse you are riding. test. A free walk should be active, marching through the body and ground covering. If you do not practice that how will your horse suddenly show up with his best walk when test day comes. Also many horses do not settle into their medium walk with purpose and a good connection. The medium and collected walks are equally as important as the medium and collected trot and canter. Practice until you feel confident about your walk work. Sportsmanship! Are you a good sport? Would others say you are? Being a good sport means trying your best while also being mindful that others are likely doing the same. We are all on our own journey some rides will be your best and some rides will not. If you have a great day remember someone else may not have, so act accordingly. Being humble about your success as you are appreciative and enthusiastic of others should be part of who you are not just how you act. Remember to also be a good sport to your horse who has no reason to be at a show other than catering to you. The way you treat your horse and also fellow competitors will say volumes about you. Packing! This gets a separate place because packing is important. Everything you need to get through a show day needs to be thought about and brought along in some sort of organized fashion. If you do not plan and pack appropriately you will take your attention away from important matters to do with presenting and taking care of your horse at the most inopportune time. Make lists and pack ahead of time. Plan your warm up! Days or weeks before a show start to figure out just how much warm up you and your horse need as a team to get to your test riding best. Factor the circumstances that might change that equation into your planning. For example weather. Cold or wet conditions may play a part in adding or taking away warm up time depending on your horses reactions to these conditions. Know how best to prepare your horse for his job by trouble shooting through warm up scenarios before you go to a show. Warming up properly is an essential skill and one which must be developed so take the time to find out what works for you and your horse as individuals. Have Fun! And your horse too! Showing should be fun for both you and your horse and if it is not, you should not be showing. Showing is an elective so do not let anyone pressure you into showing if you do not feel the urge to do so from within.. You need to be having fun so your horse can sense that from you and feel at peace and relaxed with his contribution. That is one reason to never show above the level you can comfortably school at home because added pressure might remove the fun for you or your mount and what is the point of that? If you are lucky enough to get to ride or compete a horse at all it should always be some sort of fun!